They are funny characters ….. the way they behave, they can be very inquisitive. The way they strut around is hilarious, and their colouring gorgeous. I was diving with a bunch of people in St Kilda last year and spotted this beauty. 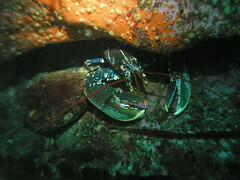 I pointed him out to the other divers, and Steve Millard took this photo. After the dive, we were all reviewing Steve’s photos, when a series of shots came up, taken after I had left the scene, of another one of the divers trying to catch this lobster !!!!! I was not pleased I can tell you. (Hey!! You wanna catch lobster, then find your own !!!). The lobster was too small to be worth eating and there was definitely not enough there to feed the other people on the boat. Catching any sea creature, with Scuba equipment on it just too easy ….. the real sport is to do it freediving IMHO. Leave them for the people who need to catch them for a living, to put shoes on their kids feet.